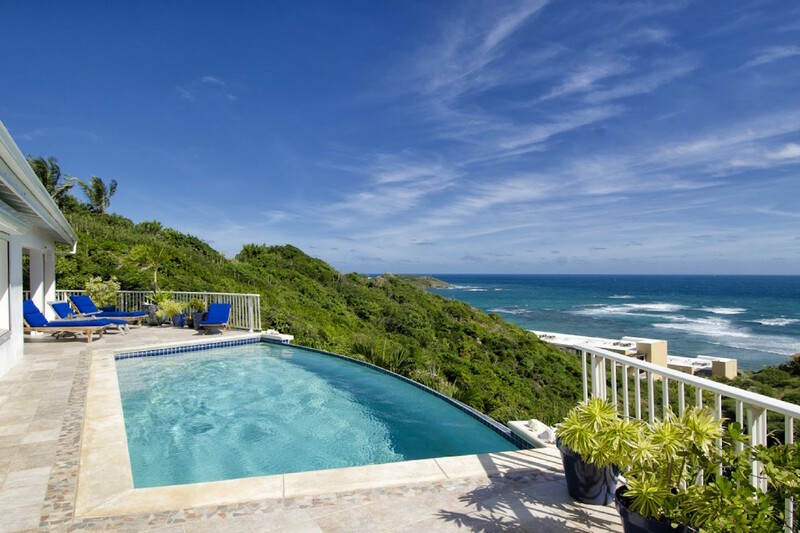 Get a gorgeous view of Dawn Beach and great access to Phillipsburg in one package at Dawn Beach Villa. Just ten minutes from Phillipsburg, here you will have access to phenomenal shopping, casinos, and amazing restaurants. The villa is just a short walk from the beach, too, and that means spacious accommodations and a perfect view of the beach from every room. A fully equipped gourmet kitchen means you can live your culinary dreams while enjoying the natural beauty that surrounds this amazing space. With added amenities like a private pool deck, an outdoor sitting area, and five spacious bedrooms, this is one vacation home you may never want to leave. Great views with a short walk to the beach! This villa overlooks Dawn Beach on the island of St. Maarten. It is a short walk to the beach and is located in the gated community of Dawn Beach Estates. Dawn Beach Estates is a ten-minute drive from Phillipsburg, the capital of Dutch St. Maarten and minutes from the border of French St. Martin. Dawn Beach is well known on the island for snorkeling. Dawn Beach villa offers ocean views from every room. The fully equipped gourmet kitchen has Viking appliances, granite counter tops, and hardwood cabinets. The tastefully decorated villa incorporates imported ceramic tile throughout the living areas and pool deck. The king-size master bedroom takes up the second floor of the villa. There are views of the Caribbean from the picture windows and the two balconies. This bedroom offers cable TV, air-conditioning, and ceiling fan. The master bath has his and her sinks, as well as a dual shower. There are two bedrooms located on the main floor of the villa, each opens directly to the pool deck and has a private bath. One bedroom has a king-size bed and the other has a queen-size bed. All the bedrooms are air-conditioned and have a ceiling fan. The partially covered private pool deck has a tranquil infinity edge pool overlooking the ocean and an outdoor sitting area on the covered terrace. Teak furniture for sunbathing, relaxing, and dining are located on the sun deck. In addition, there are two bedrooms on the lower level of the villa with exterior access. Bedroom #4 offers a queen bedroom with an en-suite bathroom with a shower. Bedroom #5 offers three twin beds with a 1/2-bath within the bedroom area and the shower is located on the outside of this particular bedroom. The 6th bedroom offers a king-size bed, air conditioning and ceiling fan, it has an en-suite bathroom equipped with single bowl sink and shower, and it is located on the main floor of the villa and it opens directly to the pool deck offering the wonderful ocean views. Experience the best of both worlds where the Dutch side offers you great shopping, casinos, and fantastic nightlife, while the French side has wonderful restaurants for your gourmet dining experiences. Everything from start to end was exceptional. The villa is beautiful and wonderfully cleaned by Rosie. Alice met us at the airport and even took us grocery shopping. She and Rosie visited with us before we left. The villa is in a great location overlooking Dawn Beach, not too close to the Westin but not too far up the hill. The villa was stocked with everything you need including paper towels, toliet paper and so many towels. The upper master bedroom is beautiful. The downstairs bedrooms both have king beds and TVs. The lower 2 bedrooms are only accessible from outside and it is a sloped walkway. All were comfortable and of good size. We did go to Galion beach which was a beautiful white sand beach with a beach bar and grill. We rented chairs and umbrellas. The rum punch was to die for. Several of our group went to the butterfly farm and raved about it. We truly enjoyed our stay at Dawn Beach Villa. Shawna, again your company knocked it out of the park. It was everything you said it was. We were surprised that the groceries and liquor were so reasonable.